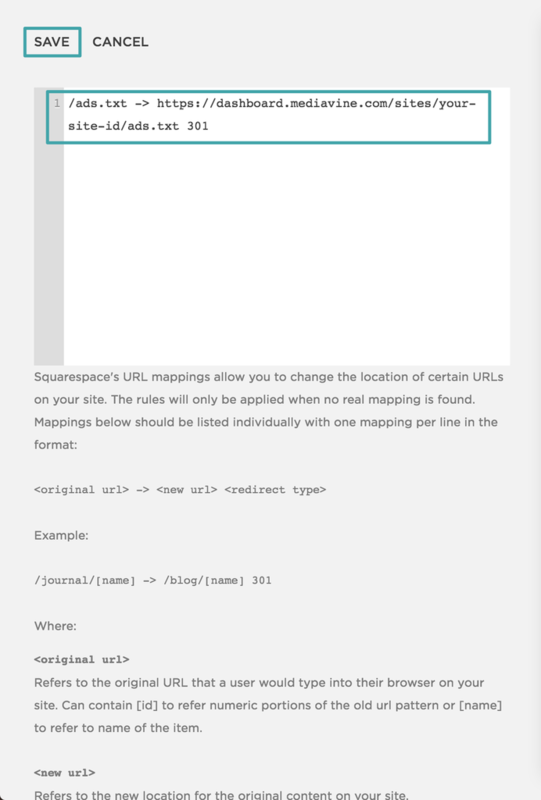 Instructions for adding Ads.txt for Squarespace sites. THIS IS NOT FOR THE FAINT-HEARTED. This involves a redirect so if you aren't comfortable, please reach out for assistance! We're happy to help! If you are sure you are comfortable proceeding, please follow the instructions below. If not, please reply to the email you received about this issue or send us a message by clicking the chat bubble in the lower right hand corner, or reach out to us via publishers@mediavine.com. 3. Replace [YOUR SITE ID] in the text line with the Site ID found in your Mediavine Dashboard under Settings > Ad Setup. It'll be something like my-baking-addiction or the-hollywood-gossip. 4. Click the Save button at the top left. 5. Check your Dashboard's Ads.txt health check the next business day after making this change. The site health check can take a while to update once the file is in place, so if you'd like us to take a look after updating to make sure it looks good, just let us know!